On board of the Arethusa. Although well-enough known through an orchestral version by Sir Henry Wood, played at each last night of the 'Proms', the song known as The Arethusa is not one found in traditional song repertoire; but yet has a fascinating history which does impinge. Even in its first manifestation as noted here it was an unlikely serenade for a hero to sing under his love's window (he was, granted, a naval hero when naval heroes abounded) but such were the exigencies of popular opera in its time … the lover may well be supposed to be giving his own ego a boost by a tale of derring-do. The words of the piece under review were penned by a Prince Hoare (not a titled name) who was born in Bath in 1755 and was, above all, a painter of portraits and historical pictures. He, nonetheless, contrived to produce a score of plays - all forgotten - in eleven years. He died in Brighton in 1834. Bore down on the Arethusa. No, no says the Frenchmen, that can't be. A few months after the encounter the Arethusa was wrecked whilst once more engaged in chasing the enemy. It was William Shield (1754-1829) who made the song in the form in which it became known. Shield was a County Durham man whose father was a singing teacher. After his father's death Shield became a boat builder although he also learned the violin and began to study music with Charles Avison (who was a noted composer and organist of the time) eventually becoming Master of the King's Music in 1817. His aspirations in music were vested in several fields including the production of glees, pantomimes, musical plays, church music, operas and string quartets as well as at least two books of musical theory. Haydn was counted as a friend. Amongst his many projects, Shield collaborated with the Dublin-born but thoroughly Anglicised John O'Keeffe on the opera The Poor Soldier (1783), from which a number of pieces were taken as fodder by various broadside ballad printers; and, like O'Keeffe, was known to have introduced traditional airs into his works. It was O'Keeffe who seems to have taken up the music of Turlough O'Carolan; but Shield, apparently, was the one who used O'Carolan's tune, Miss McDermott and welded it to the words of The Arethusa, though this may have been through the intermediary stage of Walsh's Complete Dancing Master, first published in 1730 where it carried the title of Princess Royal (see below). The song, the Arethusa, eventually appeared as such in Shield's opera, The Lock and Key, in 1796. It was certainly à la mode. The fame of Charles Dibdin (1745-1814) was at its height. O'Keeffe himself was known for such songs, Tom Starboard among them; and, indeed, Shield set the words of John Rannie's The Post Captain, often found on broadsides. And broadside printers continued to pour out pieces such as Will Watch and Ben Backstay. We know, too, that Miss McDermott was used as vehicle. For he was a bold commander. To boast of Nelson's glory. A further comparison may be made. The Bonny Bunch of Roses and, then again, The Grand Conversation on Napoleon, both of which appear in numbers of versions later in traditional repertoire, were songs which exploited even more sophisticated stanzaic patterns and we also have the example of lollipop, the air and recitative, The Death of Nelson, a particular favourite of another well-known singer, John Braham (1777-1856). In all this, at least a general period of relevance in this song context, to French wars at the latter end of the eighteenth and at the beginning of the nineteenth centuries, and then the nature of each song, including The Arethusa, as paeon, were firmly established. 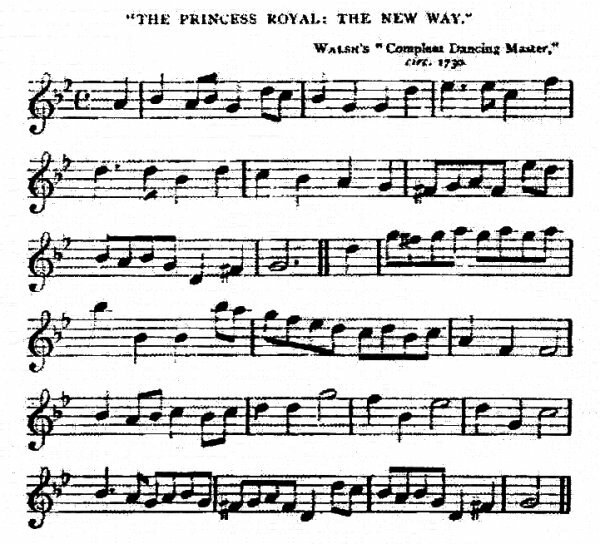 However - and, in one way to recapitulate a different history - Walsh's version of the tune was almost certainly named for Her Serene Highness Princess Anne of Hanover, Duchess of Brunswick and Luneburg (1709-1759), born five years before the occasion when her paternal grandfather, the Elector Georg Ludwig, ascended the English throne as King George I. The title of Princess Royal was bestowed on Anne in 1727 by her father, George II - she was the second princess so entitled after Mary Stuart, daughter of Charles I. Another, issued by Jennings in London and entitled The Mill, took as subject a prize fight between Tom Cribb and a 'gallant fighting Black man' who is likely to have been Tom Molineaux, a one-time American slave. If this is so the fight took place in 1810 and was followed by a return match in 1811. Cribb won both, as it happens. Interestingly, the narrative movement of the piece appears to have anticipated the fight itself - which is not described - and looks to have been meant simply to stir interest, suggesting, for instance, that Cribb must be laid low. And the tune would have had to be adapted since the text lacks certain crucial forms of lines towards the ends of each stanza in the Arethusa. The George piece, incidentally, follows the Arethusa pattern exactly. There is still another aspect to note. The apparent date of genesis of the tune and its immediate pedigree have a particular bearing on any absorption into Morris dance tradition where it became well-used - a firm standby (as a jig) at, for instance, Bampton, Bledington and at Ilmington. It could well have been taken into repertoire before the end of the eighteenth century … the name, springing, it seems, directly from Walsh, might suggest this. It really is quite an extraordinary story. At risk of overloading the piece with significance, we can yet see in the elements of its makeup signs of how a particular piece and, perhaps, others like it, moved around and between various social and imaginative milieux. In this case, the movement began beginning with the long-established though essentially declining mutuality of Big House patronage of music and song and poetry in Ireland and touched the very act of crushing the indigenous culture of Ireland. It reflected the taking up of things Irish and Scottish (and, as it happens, Welsh - a neglected subject) both as romance and, it may be felt, as a way in which to cement the growing sense of British identity during and, most especially, at the end of the eighteenth century - between, that is, the Act of Union with Scotland in 1707 and then with Ireland in 1801 and through a period of anxiety coincidental with riot and rebellion - 1715 and 1745 are major examples but with the addition of many food riots, riots for and against Catholic emancipation, election riots and so on to one of unification of sorts against a common enemy, France. It may be said to have been part of a widespread indulgence in popular musical and dramatic forms during the first part of the nineteenth century which began to escape the dominance of Italian form. There was a continuing commercial spin-off during the nineteenth century through the circulation of printed material especially as a facet of the school of Jolly Jack Tar-ism. Then, underlying and sometimes weaving in with this melange, there was a kind of parallel interest in the realms of traditional song as celebration of actual victories and actual heroes. Finally, the tune appeared as a feature of continuing and healthy Morris dance contexts. Disclaiming possible smugness, one wonders how many Promenaders would be aware of this history. 1 - Most detail in this piece comes from websites; but I must thank Malcolm Taylor and Peta Webb at VWML for their helping assembling text; and Cambridge University library for permission to quote from the Madden collection of broadsides. 2 - See, for example, Terry Moylan: The Age of Revolution in the Irish Song Tradition (Dublin, The Lilliput Press in association with the Goilin Singers Club, 2000) pp.5-6. 3 - This is from Madden, Reel 91, Number 625. There is no imprint but the Reel number suggests, like others with the number 91, printing in Cork. 4 - See English Folk Songs Collected and Arranged by Cecil J Sharp, Vol.2 (London, Novello, 1912), pp.94-96. Sharp's manuscript version is in Folk Tunes as 238O, collected from Tom Gardiner in Blackwell, Warwickshire, September 9th 1909. 5 - See Lucy E Broadwood: English Traditional Songs and Carols (London, Boosey, 1908), pp.34-35. 6 - See the Madden collection, Reel 90, Number 363 … from Storer in Bristol. 7 - This extract is from the web which, unfortunately, did not provide a reference (nor have I been able to locate the article so far). Further, though, the substance was repeated in an article for Musical Times (October 1, 1894) which Baring-Gould used in notes on The Arethusa in English Minstrelsie, Vol.3 (Edinburgh, T. C. & E. C. Jack, 1895), Notes to Songs, p.vii. 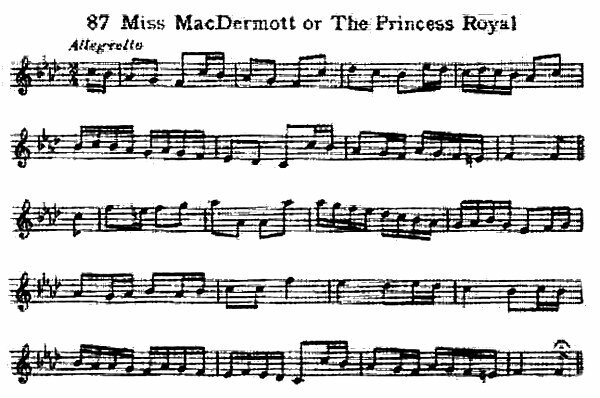 8 - For details of O'Carolan's life, see Donal O'Sullivan: The Life Times and Music of an Irish Harper (London, Routledge, 1958), especially in Vol.2, p.52, where he discusses the dedication of the tune to Elizabeth McDermott Roe. 9 - Printings include those from Jennings in Madden, Reel 74, Number 334; Catnach in Madden, Reel 77, Number 693; Taylor (London) in Madden, Reel 80, Number 19; Fordyce in Madden, Reel 83, Number 367; Swindells in Madden, Reel 85, Number 155; and Keys (Devonport) in Madden, Reel 90, Number 35. The text as given in this piece is composite, taking into account differences in orthography; but the various texts used are commensurate. 10 - See Madden, Reel 74, Number 338, from Jennings. 11 - See Madden, Reel 74, Number 334, from Jennings.